I never really understood the need for sunglasses until I moved to Phoenix back in 2004. With over 300 days of sun and the glare from the desert, they were a must. Now that I live in sunny southern California, I still wear sunglasses every single day, so I don’t mind spending a bit more on a nice pair. Every year or two, I’ll buy a high-quality designer pair because I know it will last me a long time. And even with a steeper price tag, I think about the daily wear cost, which would be in the pennies when I think about how often I wear them. I tend to invest in a quality pair that is extremely versatile and timeless (think, brown or black with a more timeless shape). Now, I do think there are plenty of reasons not to invest in an expensive pair of sunglasses: 1) you are clumsy; 2) you often lose things; 3) you regularly break things; 4) you prefer to have many styles to alternate on a daily or weekly basis; 5) the sunglasses are trendy and not quite as timeless. Both the Jimmy Choo and H&M versions have a retro – 70’s feel, and are not cookie-cutter with their geometric shape. Both have lovely gold-tone accents on the sides and a versatile brown color. 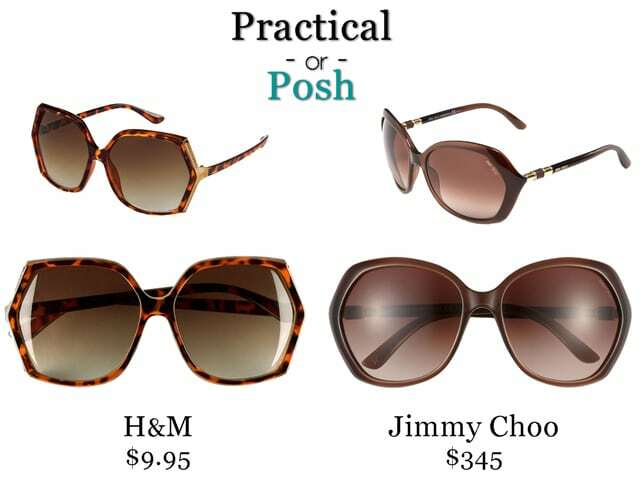 I would not quite consider these timeless, so would more likely opt for the H&M version, although I would love to have either in my sunglasses collection.